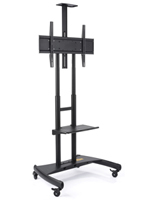 Safely store equipment in this floor standing TV cart with power management. 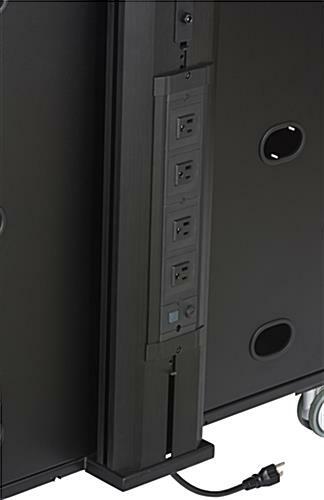 The black display stand cabinet features adjustable shelves and an incorporated electrical strip with an on/off switch. 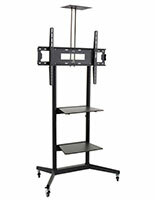 With a maximum capacity of 330lbs, this durable TV cart is capable of confidently holding screens up to 84”. 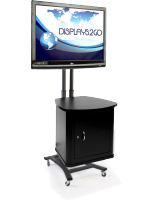 The black powder coated finish on this display stand looks professional and easily blends well into any environment. 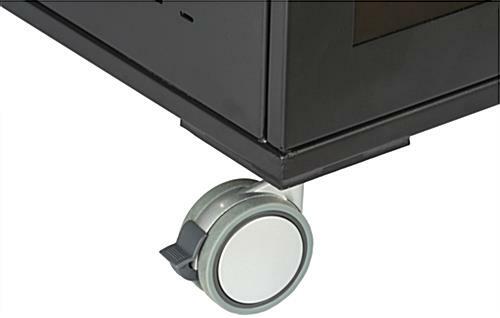 Enabling mobility from room to room, 4 casters offer an ease of movement when needed while 2 brakes allow stability. 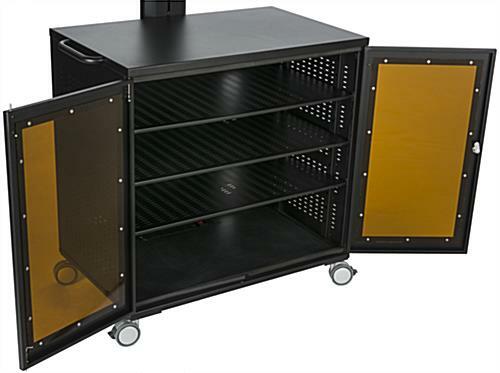 Plexiglass cabinet doors allow TV cart devices to remain out of sight while still keeping remote control functionality. 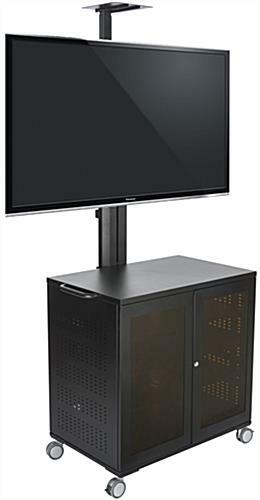 31.5" x 80.0" x 25.5"
31.5" x 29.0" x 19.8"
This mobile TV stand with storage is very sturdy and fits in very nicely with our office décor. 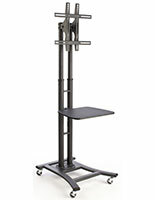 It is very versatile, as we have mounted a camera on the top shelf for mobile video-conferencing. 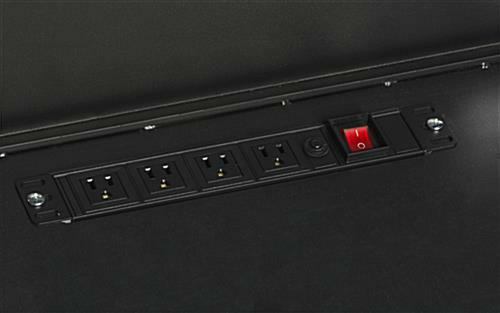 The locking storage is quite roomy, we store a PC, keyboard, extension cord and still have additional room. 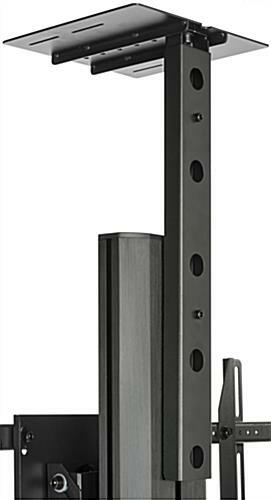 It is very easy to construct and it shipped quickly. The customer service at Display2Go is outstanding! Highly recommend this product! Thank you so much for the rave review, Besty! 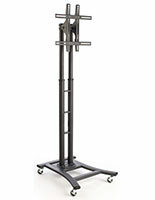 The unit itself, once assembled, is just as advertised, however, it shipped with many crucial parts missing. The support folks were helpful, but I had to call three times to get all the parts I needed, causing a two week delay. When it was assembled, there were many screws left over, so I suspect that the wrong parts bag was put in the box , plus the instructions that came with it were not quite right. Make sure you download the latest instructions from the displays2go website and go over your parts carefully. This is the second one of these I have assembled; the first one assembled with no problems. I suspect it was a bad day for the factory in Shanghai. We're sorry to hear about this frustrating situation, Mark! One of our customer care specialists will reach out to assist you. Thank you for making us aware of this. 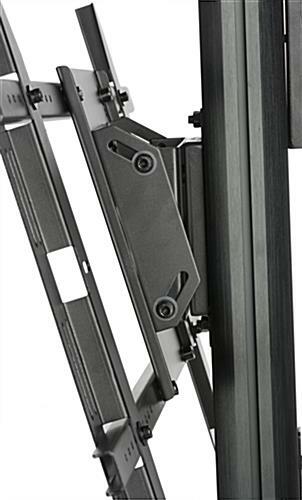 Unfortunately, when I received the stand there were several scraps, scratches, dents and dings. 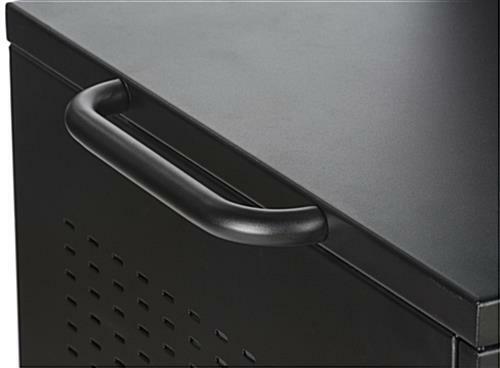 The front panels on the cabinet had cracks by where it looked like the screws had been tightened too tightly. 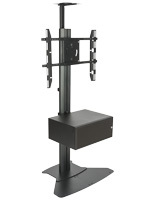 When we assembled the TV mount, the bar was twisted slightly so putting in the mounting screws was difficult. I'm not sure if all this damage was in shipping, in manufacturing, or both. 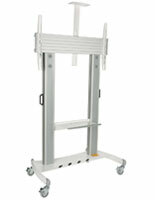 Once we got the unit together, it's solid and definitely what we needed as far as usage and utility. Hi Sharon, We're sorry to hear about the condition your order arrived in. 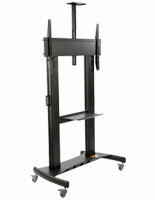 One of our customer care specialists will look into this and reach out to you shortly.